Talk show host, movie actor and all-round funny guy, Jimmy Fallon did such a bang-up job of hosting the 2010 Emmy Awards that he’s our Number One pick for hosting the Oscars in 2012. Fallon was born in Brooklyn and grew up in Saugerties, New York, the younger of two children. In 1998, Fallon got his big break: an audition for Saturday Night Live (SNL), earning a spot as a Featured Player for the 1998-1999 season. Promoted to the main cast in the summer of 1999, he began co-hosting “Weekend Update” with Tina Fey in 2000. After six seasons, he left SNL in 2004. 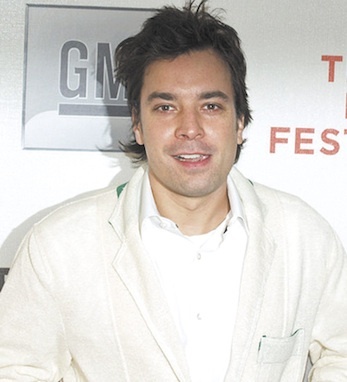 In March 2010, Fallon was awarded the Irish Spirit Award from The American Ireland Fund. During his speech, he said, “My life has changed so much in the past year, but being Irish hasn’t changed.” Most recently, in honor of two years of Late Night with Jimmy Fallon, Ben & Jerry’s released a limited edition flavor, Late Night Snack.